Marengo County was created by the Alabama Territorial Legislature on February 6, 1818, preceding Alabama’s statehood by almost two years. The land was acquired from the Choctaw Indians under the 1816 Treaty of Fort St. Stephens. In 1817, a group of French immigrants who had been given refuge in the United States after a slave rebellion in Haiti, were given land to establish a colony dedicated to growing wine grapes and olives. The romantic version of the Vine and Olive Colony is based in American mythology about the frontier and the “can-do” spirit of the pioneers. According to folklore, in 1817 exiled French military aristocrats loyal to the recently-deposed Emperor Napoleon founded the Vine and Olive Colony at the confluence of the Tombigbee and Black Warrior Rivers. Marengo County Alabama is a county of the state of Alabama. As of the 2010 census, the population was 21,027. The largest city is Demopolis, Alabama and the county seat is Linden, Alabama. 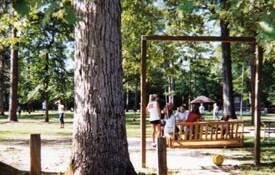 Marengo County Alabama is home to the Alabama Rural Heritage Center and Chickasaw State Park. The Tombigbee River and Black Warrior River form portions of the western and northern county borders and provide recreational opportunities.